Part two of this month’s report will be a look forward at what the housing and lumber markets may look like in 2018. The general consensus among leading construction analyst is that, despite headwinds, the housing market will continue its steady growth trajectory once again next year. That being said, I doubt these same analyst built in the potential impacts that two major hurricanes and a catastrophic forest fire season, would have on the construction market in their 2017 projections. Nor did they forecast that a trade dispute would play havoc on the volatility of lumber prices. The point is, no one can fully anticipate all the underlying forces that can influence the housing and lumber industries. They are just too complex and intertwined with external dynamics. And all those external dynamics make it difficult to forecast with much certainty, what will happen next week, next month, or next year, within our industries. It is a constantly changing landscape, it would seem, now more than ever. But, hopefully we can get back to some semblance of order in 2018 and get a steady diet of fastballs rather than all of those curveballs. The number one issue hanging over the lumber market in 2018 will again be the U.S.-Canadian softwood lumber trade dispute. The final determination is scheduled within the next ten days but most believe it will be a positive decision in the favor of the U.S. lumber coalition. Canada seems so sure of it that they have already filed appeals with NAFTA and now with the World Trade Organization. After the final ruling in December, the duty would start to be collected again. Many fear that Canadian mills will try and bump numbers to cover the duty once again. The duty is seen as a tax on American home builders and home buyers that makes housing less affordable for American families. Our best option is for the U.S. and Canada to move forward on an equitable trade agreement that will provide a reliable and affordable supply of lumber to meet housing needs of the American consumer. The U.S. lumber production is not sufficient to meet U.S. wood demand. Roughly one-third of the lumber consumed in the U.S. last year was imported. Ninety-five percent of those imports came from Canada. We need Canadian wood to build America. We also need the Federal Government to boost domestic lumber production by seeking higher targets of timber sales from publicly-owned lands and open up additional Federal forest lands for logging in an environmentally sustainable manner. We need to become less dependent on Canadian fiber. It would be a welcome sight to see common sense decisions trump (no pun intended) the advances of special interests groups. The impact of the BC fires and the overall shortage of Canadian logs will be a significant long-term challenge for the industry. 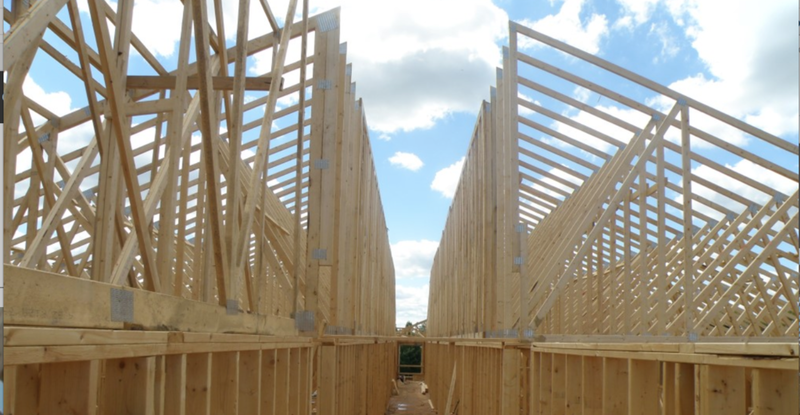 Expect 2-inch SPF framing lumber, especially in narrow widths, to be tight coming into next year. While the increases have seemed to peak for now, it is hard to envision any major pullback in pricing for the species in the next sixty days as mills push order files out to the end of the year. The Southern pine narrow’s market has shown strength in recent weeks mainly due to buyer’s substituting the SYP for SPF to take advantage of a wide price spread between the two species. Overall, the SYP market seems to be stable and we expect a reasonable balance between supply and demand through the first quarter. Oriented Strand Board has been a thorn in the side of the marketplace for most of the year. By mid-October, OSB’s benchmark product, seven-sixteenth sheathing, had gained $185mbf off its January low. That’s an increase of 69% or almost $6 per sheet. While the market has given back some of those gains the last few weeks, OSB remains a volatile commodity. Additional OSB production is anticipated in the first quarter, as multiple new OSB mills come on line, and several shuttered mills reopen. Hopefully, this will effectively stabilize pricing of this staple building product in 2018 and beyond. In a 2018 North American Construction Forecast report prepared by Oldcastle Business Intelligence, they project lumber costs to increase about 4% in 2018 after a ten percent increase this year. Contract Lumber’s Composite Framing Index currently sits 26% higher than when the year started. Looking at a two year period, the index has jumped 47% from January 2016 to present levels. While it would be hard to anticipate ever having another year of natural calamities to fuel the lumber market like we did this year, we are still expecting moderate volatility in lumber prices as the housing market grows in 2018. We expect higher lows and, yes, quite possibly, higher highs in 2018 if the housing market performs as anticipated. In all likelihood, labor will once again be the building industry’s biggest challenge in 2018. The current crackdown on immigration is having a negative impact on the largely Hispanic construction workforce. What this country (especially the construction industry) desperately needs is a common-sense policy that encourages and attracts legally authorized workers from other countries, who are willing to do the “hard” work that a majority of young Americans are unwilling to do. Unfortunately, the current political climate does not seem interesting in solutions to ease the supply-side constrained construction labor market, regardless of housings ability to stall economic momentum. Prepare for a construction labor situation that is likely to worsen in the months ahead, especially as rebuilding efforts in Texas and Florida proceed, attracting local workers with higher pay for restoration and repair jobs. Raising wages and square foot numbers is the immediate lever to remedy labor demands. The downside is that it puts upward pressure on home prices and rents, adding to housing’s affordability issue. There is no reason to think that there is any immediate reprieve from higher land prices and access to buildable lots on the horizon. While the Trump administration has set their sights on removing some overly restrictive zoning and building regulatory constraints, it will take time to see any significant overhaul that developers and builders will feel. The affordable/entry level home market will take the biggest hit from these escalating land costs, as evident in the statistic that 51% of the homes sold so far in 2017 were priced in the top one-third of home values, essentially out of reach for first-time buyers. The millennial buyer is being forced out to the suburbs where homes are more affordable because of lower land costs, even though the homes may be farther from urban job cores. A healthy economy drives a vibrant housing market and signs point to a fit and strong U.S. economic engine moving into 2018. Real Gross Domestic Product is expected to rise by over 2% in 2018, according to the International Monetary Fund, and the unemployment rate will continue to decline, falling below its pre-recession average. Interest rates, while drifting upward, are still at historic lows, with the 30-year fixed benchmark rate currently under 4%. The Federal Reserve is expected to raise interest rates by a quarter percent in December and raising interest rates are a source of major concern for builders, especially when coupled with swelling home prices. Home prices are anticipated to increase again in 2018, but at a slower pace than the current 7% annual growth. Analyst expect something more in the line of 4% home value growth next year based on a severe housing inventory shortage. While the middle of this year’s housing starts data underperformed, the past couple months have seen a resurgence of building starts to levels that have breathed life back into builder confidence. The Oldcastle report averaged forecasts from six different sources (including NAHB, MetroStudy, and the Mortgage Bankers Association) to come up with a consensus projection for 2018 housing starts. They project the pent-up single-family market to expand by 9%, to 926,000 starts with all the key support fundamentals of population growth, increasing household formations, strong economic conditions, and low interest rates, contributing positively to this segment. They expect a slight decline (1%) in the multi-family sector to 373,000 units based on overbuilding in some areas and the uptick in single-family home purchases. Multi-family numbers will remain volatile from month-to-month. A look at the metro areas of the core cities we serve have the following 2018 housing projections. Columbus (+3%), Cincinnati (+2%), Indianapolis (+12%), Charlotte (+4%), Raleigh (+5%), Atlanta (+6%), Nashville (-5%). Several states of interest are projecting double-digit growth statewide, including Indiana (+10%), Kentucky (+13%), Virginia (+10%), and West Virginia (16%). There are a couple of items that we should all be watching as the New Year approaches. Tax reform is advancing through Congress after a version passed in the House. There are elements of the legislation that NAHB leadership is concerned would be detrimental to middle-class homeownership. The powerful NAHB lobby opposes any measure that reduces the value of mortgage interest and property tax deduction that will have a negative influence on home buying, as well as home prices. NAHB supports other components of the bill that contain positive elements for housing, like provisions to boost the production of affordable housing and tax reductions for small businesses, which many home builder’s businesses fall under. The other concern plays out more on the world stage. Global instability (North Korea, Islamic terrorism,) continues to make it feel like we are walking a stability tightrope, where one major slip could have dire consequences. Fortunately, most markets seem to have blinders on, and are unwilling to let those tensions slip into their pursuit of success. In conclusion, 2018 is shaping up to be a very positive year for the building industry, as the job market and overall economy continue to advance. It will not be without its challenges as builders struggle to manage rising construction costs. But there will be no shortage of demand for housing. The question becomes, is there enough labor to build it and can you hold your budgets together through the process to make it profitable. At least these seem like manageable challenges verses what Mother Nature dumped on us in 2017.